I have taken a stroll around the Cathedral Close in Lichfield a few times each day during this week’s visit. From one moment to the next, the close can move from being a-buzz with tourists and schoolchildren to being an oasis of peace and calm, particularly in among the 15th century timber-framed houses in the hidden courtyards of Vicars Close opposite the west door of the cathedral and behind Erasmus Darwin House. At times, it is hard that this unspoilt and peaceful corner of Lichfield was a fortified area in medieval times. It was surrounded by a stone wall on three sides, and was protected naturally on the fourth side, the south side, by the waters of the Moggs, now Minster Pool. According to a 14th-century chronicler, the castle (castrum) of Lichfield was fortified by Bishop Clinton (1129-1148). Soon after, the Close was described as a castellum ca 1200, and by the 14th century the mill in Dam Street on the south side of the Close was known as Castle Mill. There is still evidence of the medieval fortifications in the south-east corner of the Close, where the walls and the foundations of the south gate have been uncovered, while some remains of Bishop de Clinton’s Palace can be seen in the north-east corner. Saint Mary’s House, in a corner in the south-east, is built over a medieval dwelling and still incorporates some of the wall and a staircase tower from the 14th century. The Old Stables nearby, once a stable block for Bishop Hacket, now serve as the Visitors’ Study Centre, with a café and offices for some of the cathedral clergy and staff. Approaching the Cathedral Close this afternoon from Beacon Street on the west side of the close and the cathedral, I passed between the site of the old Westgate on one side and Newton’s College on the other. But – until the 1970s – the Cathedral Close had another college: on the south side of Cathedral Close this afternoon, I found myself looking at the site of the former Lichfield Theological College. Visiting the site of a former theological college may sound like a busman’s holiday for a theological college lecturer, but Lichfield Theological College was a pioneering institute in its days, and there are quite a few reasons for me to have happy memories of it. Lichfield Theological College never acquired the same reputation as, say, Westcott House and Ridley Hall in Cambridge or Ripon Cuddesdon, Saint Stephen’s House and Wycliffe in Oxford. But in its days it developed some pioneering and trail-blazing “sandwich” courses, involving its students in parish as well as academic work, and it also catered for older ordination candidates. Lichfield Theological College was founded in the Cathedral Close in1857, and was the dream of John Lonsdale (1788-1867), Bishop of Lichfield. In 1872, the college moved into premise on a site in the close where another college had stood from the early 15th century. An earlier Bishop of Lichfield, John Burghill, assigned this site in 1411 for the New College, which was a residence for 13 cathedral chantry priests. The New College was built in 1414 as a range of rooms around a central courtyard and was rebuilt in 1468. The hall stood at the south-east corner, with a kitchen and dining room at the west end and a chapel in the west range. After the dissolution of the monasteries and the chantry chapels and college in 1548, the New College was sold to London speculators. By 1564, it was owned by the Archdeacon of Stafford, Richard Walker, who was also master of Lichfield Grammar School. The New College buildings were acquired by Lichfield Corporation, and in the late 17th century the former college was divided into three or four separate houses. After the former college buildings and houses were acquired by Lichfield Theological College in 1872, a library and student rooms were built on, and a chapel was added in 1885. 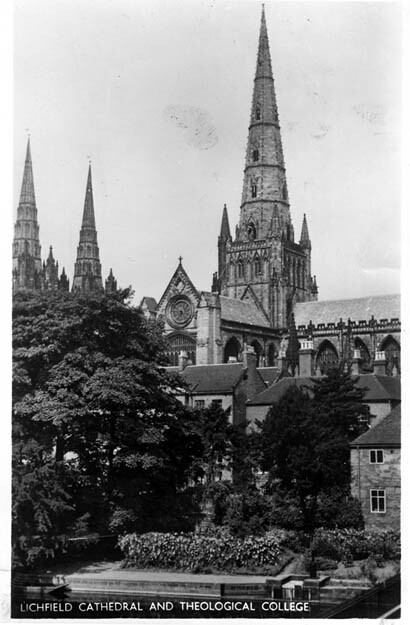 In 1908, the students moved into Selwyn House, on the east side of the Cathedral Close. This house was a hostel for students at Lichfield Theological College until 1922, and again from 1931. In the intervening years, the house served as the bishop’s residence. As a hostel for theological students it was known as Selwyn Hostel, taking its name from Bishop George Selwyn’s widow, Harriet Selwyn. The house was built in 1780 for Canon James Falconer and was enlarged in the early 19th century. The principal’s residence was at No 20, which stood on a site acquired by Bishop Hacket after the Caroline Restoration. The bishop built a stone house on the site in 1666, possibly as a banqueting hall. Later, the house was used as the diocesan registrar’s office and muniment room, and for a few years at the beginning of the 19th century Richard Wright used the house as a museum. The house was demolished in 1819, and rebuilt in 1833. In 1871, it was acquired for the Principal of the new Lichfield Theological College. A former principal, Dr Charles Hahn, was a controversial figure in the 1950s, when he resigned in protest at the Church of England’s decision not to take disciplinary action against a vicar who had married a divorced woman. Dr Hahn joined the Roman Catholic Church in 1958, and was succeeded as principal by the New Testament scholar, the Revd Dr John Fenton. The last Principal of Lichfield Theological College, Canon John Yates (1925-2008), was appointed in 1966 in succession to John Fenton. He continued as the principal for the next six years, and in 1971 he was appointed Prebendary of Flixton in Lichfield Cathedral. One afternoon in 1971, after I had slipped into the cathedral stalls for Choral Evensong, he introduced himself to me and asked me whether I was considering ordination. Little did he know that shortly beforehand I had a wonderful religious experience visiting the chapel in Saint John’s Hospital. Jean and John had remarkable social consciences. They spoke out against discrimination and they were deeply concerned for the poor and the marginalised. They kept an open house in the Close, and in the brief time I knew them I was welcome to drop in. Another lecturer at that time was Barry Rogerson, who was Vice-Principal of Lichfield Theological College. He became the first Bishop of Wolverhampton in 1979, and was Bishop of Bristol from 1985 until his retirement ten years ago in 2002. As Bishop of Bristol, Barry Rogerson ordained the first 32 women priests in the Church of England on 12 March 1994 in Bristol Cathedral. When the Church of England carried out a thorough-going reorganisation of theological colleges in 1972, Lichfield Theological College was closed and John Yates moved from Lichfield to become Bishop of Whitby. When the college closed in 1972, the trustees rented the Principal’s House and the college buildings to the trustees of Saint John’s Hospital, while Selwyn House was turned into flats. The college buildings, apart from the chapel, were demolished within a few years. Excavations on the college site in 1976 revealed medieval vaults that formed part of the buildings on the site. The archaeologists concluded that a 15th century building and its extensions were incorporated into the fabric of the west wing of the former theological college. Parts of the original building lie beneath the ground, on the south-west side of the garden. Further excavations in 1977 a little to the north revealed a multiple-phased sequence, with Neolithic struck flint fragments, and later Saxon and medieval features such as late Saxon pottery and late Saxon graves that suffered when the Minster Pool was formed. They found evidence of a square stone-and-timber building built at the edge of the Minster Pool in the 13th century. The Lichfield blogger, Annette Rubery, has an old postcard with a photograph of Lichfield Theological College in her collection of postcards. The photograph shows how the college enjoyed splendid gardens – and it appears there is a punt moored on Minster Pool at the bottom left of the photograph. I am looking forward to reading Annette’s new book, Lichfield Then & Now, which is due to be launched later this month. My great-grandfather on my mum's side, Arthur Lomax, apparently graduated from Lichfield College in 1866. He was originally from Manchester and had been married for only four years. I know from records in Manchester that he was a teacher prior to leaving for Lichfield, but I have no idea why he decided to study for the priesthood or why he later left England for South Africa where he was ordained as Deacon and Priest at St Paul's, Rondebosch, Cape Town. Was the SPG big at Lichfield? There is so much mystery surrounding this giant of a man...well, a giant in my eyes. He went on to serve as priest at St Mary's in Mowbray and then later to plant many churches in the Eastern Cape where he finally served as Rural Dean of Craddock. We have located his grave, along with that of his wife May Ellen (Conroy) in a small town by the name of Steynsburg. He had quite a large family, many of whom married into French Huguenot families.